The NT 70/3 vacuum is a large, powerful wet/dry vacuum cleaner with three motors. 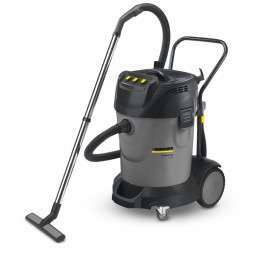 A machine that shines especially when it comes to wet applications and vacuuming coarse dirt. Strong suction power as well as tried and tested Kärcher quality at a low price. Ideal for the automotive industry, BSC’s/contract cleaners, agriculture or the transport industry.